The laziest boy in the village naps and daydreams instead of working. One day, a rich man and his daughter move into the town and the lazy boy begins to devise a plan to become rich without working. In the end, the boy is rich, but not the way he wanted. 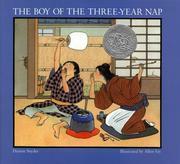 Snyder, Dianne, “The boy of the tree-year nap,” Children's Picture Book Database at Miami University, accessed April 23, 2019, https://dlp.lib.miamioh.edu/picturebook/items/show/8415.